ROCKMAN wrote: k - Mucho thanks for all the facts. The continuing irritation is the misuse of the term "consumption". It so easily confuses folks who don't understand that much of US oil "consumption" is the oil "consumed" by our refineries with the resultant products exported to the actual foreign FINAL CONSUMERS of that rather large volume of US oil "consumption". And even though that FACT has been repeatedly explained by you and the Rockman et al some here still INTENTIONALLY use that poor terminology in their arguments. As the famous Texas comedian Ron White has said: "You can't fix stupid." And foreign consumers that make up a growing, global middle class, for which I recall one article point out that we will need around four more Saudi Arabias to stay afloat. Clearly, one "energy[-]producing superpower" won't be enough. It has been so far. Jimmy Carter once put forth the idea (at one point co-opted by doomers) that we needed a new Saudi Arabia every 3 years not to run out of oil by the end of the 1980's. Turns out, along the way, we really only needed to find one. Remind us again Ralfy, do you live in the land of the exceptional, or do you live somewhere that suffers exceptional-envy? Your graph is out of date, and therefore deceptive Revi. We are now closer to 12 million barrels a day than where we were in 2015. The resource play revolution marches on, undeterred. The EIA thinks that "little peak" in US oil production from shale is the start of a giant "mesa" of high levels of US oil production extending out into the 2040s. Personally, I hesitate to predict what it will do into the future. Certainly their kind of work isn't for everyone. There are only a few organizations on the planet with the abilities to even attempt it. Plantagenet wrote: I never anticipated the huge amounts of oil we are producing from TOS right now, and I don't see why oilcos couldn't continue to frack and produce oil in the same way for decades, assuming there is enough TOS to keep it all going. AND the potential amount of oil in US shales is enormous....some estimates of TOS reserves just in the Permian Basin run into the 10s of billions of barrels. The USGS has 60 billion in just the Delaware and Midland alone, Wolfcamp in particular across both, and some other formations within the TPS concept in the Delaware. coffeeguyzz wrote: As far as the US goes, you Peak Oil guys might consider taking up another hobby. Just sayin'. Indeed. But then peak oil was always about a belief system, it wasn't related to geologic facts or science, folks just cherry picked their spiritual leaders, and began reading the peak bible and learning the mantra. And those who knew it even back then tended to be underappreciated, but nowadays, looking back, they pegged it right on. Why show a chart ending in 2015, given that it's now 2019. 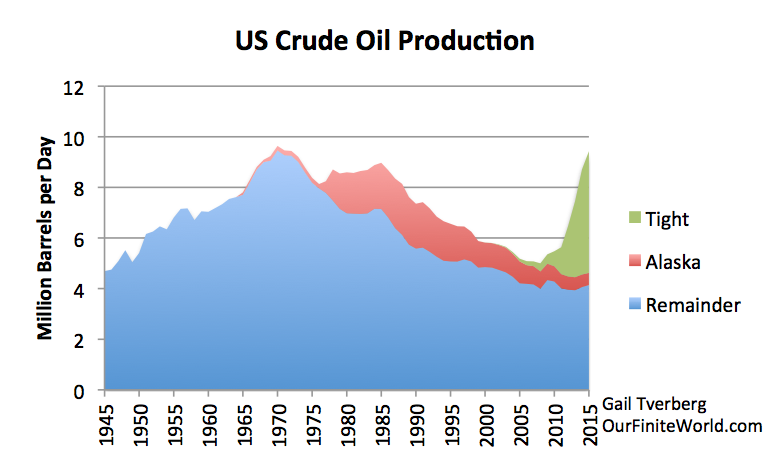 Here's a US field production chart ending a week ago from the EIA. I still think when global "peak oil" from the supply side actually occurs, we'll know it, because total production will be stagnant or declining in the face of rising prices, for several years. That will indicate that the profit incentive can no longer easily induce higher production. In the mean time, with relatively low prices (for the past 10 years) and production increasing significantly, it looks like nothing close to peak oil now. Why we should listen to various random peakers like shorty claim they know what's coming next when all their past predictions of economic doom re oil have been dead wrong is beyond me. The markets overall are probably as good an indicator of a barometer for future prices as anything. Looking out at WTI futures for the next 9 years, the prices are roughly flat. Not exactly a sign of panic over shortages. Nor a sign of the market being willing to oversupply by much at current prices. The EIA predicts future US oil and NGL liquids production will depend on the economic and price scenario, and the forecast scenarios differ sharply. The low oil price and demand scenarios show a significant, roughly linear decline after about 2020. The more optimistic high price scenarios show dramatic growth in the short run, with high oil prices lowering production (I presume via lowered demand) by roughly 20% from the peak by 2050. See page 53 of the EIA Annual Energy Outlook 2019 (link below). The EIA predicts solid US Natural Gas production growth in all but the most bearish reference case. The most bearish case is roughly flat, declining by roughly 5% by 2050. See page 71 of the EIA Annual Energy Outlook 2019 (link above). Natural Gas relative production looks optimistic relative to oil, even though all the price reference cases show increasing Natural Gas prices from a few years out to 2050. Worst case is more than tripling retail natural gas prices by 2050. See page 73 of the EIA Annual Energy Outlook 2019 (link above). Worst case retail gasoline price projections to be roughly doubling by 2050, and worst case retail diesel prices somewhat more than double. See page 67 of the EIA Annual Energy Outlook 2019 (link above). Presumably these folks have a better handle on things than the average layman speculator, especially given the relative track records over time. I certainly don't see anything implying we'll be "running out" any time soon. And surely by 2050, if not 2030, if you don't like buying lots of gasoline and diesel for your car, BEV's are likely to be very much "a thing". At what relative total cost to operate remains to be seen, of course.